"The FAA decided to do safety on the cheap which is neither cheap nor safe and put the fox in charge of the hen house," Sen. Richard Blumenthal, D-Conn., said at a hearing. Federal aviation regulators plan to increase their oversight of air safety by this summer, the U.S. Transportation Department’s watchdog told lawmakers Wednesday. The comments were made at a congressional hearing that focused on how the FAA approved the Boeing 737 Max aircraft that has been involved in two fatal crashes in five months. Lawmakers pressed officials on Boeing’s role in the airplane’s approval. Outside companies like Boeing routinely participate in some functions of the certification process. "The fact is the FAA decided to do safety on the cheap which is neither cheap nor safe and put the fox in charge of the hen house," said Sen. Richard Blumenthal, D-Conn. The Senate’s Commerce subcommittee’s hearing was the first since the U.S. joined dozens of other nations in grounding the planes earlier this month. Panel members are likely to raise questions about a plan for a software fix to the jets that Boeing said it gave the Federal Aviation Administration in January. "We want to know how Boeing, how private companies, are involved in the FAA certification process," Sen. Ted Cruz, R-Texas, who chairs the Senate Commerce subcommittee on Aviation and Space, told CNBC’s "Squawk Box" on Wednesday. "Why didn’t that process catch this problem if that was the cause of the accident and what needs to be done to make sure these planes are safe to fly?" 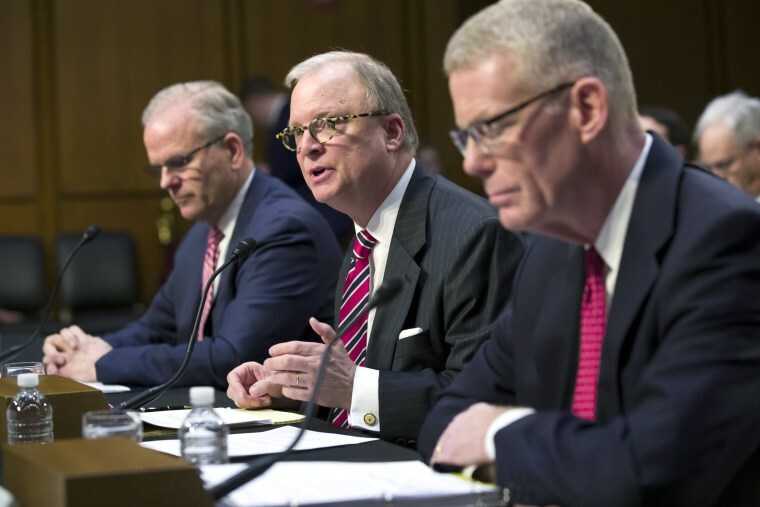 Acting FAA Administrator Daniel Elwell, the Transportation Department’s Inspector General Calvin Scovel and Robert Sumwalt, chairman of the National Transportation Safety Board, testified Wednesday. Scovel said in his written testimony that the changes that will take effect by July 2019 are in response to a 2015 report from his office that said the FAA needed to improve its oversight of the aircraft certification process when aspects of it are delegated to third parties, such as aircraft manufacturers like Boeing. A key issue of the hearing was how much scrutiny regulators gave the new design of the aircraft before signing off on it in March 2017. Investigators in the October crash of a Lion Air plane in Indonesia have indicated pilots were battling an automatic stall prevention system Boeing added to the jets before their debut. That program, known as the Maneuvering Characteristics Augmentation System, repeatedly pushes the nose of the plane down if a sensor perceives the aircraft is in a stall. Elwell defended the role of private manufacturers in the certification of aircraft and said the FAA has “very strict oversight” over those third-parties. He said to do that job at the FAA, the agency would require about 10,000 more employees and $1.8 billion. Investigators have said they saw “clear similarities” between that crash, which killed 189 people, and that of an Ethiopian Airlines Boeing 737 Max 8 that went down after takeoff on March 10, killing all 157 people on board. Pilots said they were not aware Boeing had added the system until after the Lion Air crash. The FAA did not mandate simulator training, and some pilots said they received an iPad training course of about an hour to transition from the older models of the Boeing 737 to the 737 Max. Elwell said the FAA granted Boeing an amended certificate for the 737 Max, because it was so similar to previous models and that a flight safety board of pilots from Europe, Canada and the U.S. did not recommend additional training for pilots to start flying the new model. Asked whether the investigation of the Lion Air crash would change how the FAA certifies aircraft, Elwell said: "Absolutely. That's how we get better." Boeing has changed the software to give pilots greater control, and the FAA expects to have a final version in the coming days, according to a person familiar with the matter. The agency needs to approve the program before it can be installed on aircraft. Boeing said it took a test flight with the new software along with the FAA on March 12, the day before the U.S. grounded the planes, and that that flight "demonstrated that the airplane, with the updated software, still meets certification requirements." Among the changes Boeing has made to the system are the use of two sensors that gauge the angle of attack — the angle of the plane relative to oncoming air — instead of one, and the limits on how many times the plane’s nose will automatically tilt downward when MCAS is engaged. Boeing previously charged customers to add a feature in Boeing 737 Max cockpit displays that shows the plane’s angle of attack and another that shows when the sensors disagree but said Wednesday it would make those displays complimentary. Customers who have already received 737 Max planes can retrofit the planes with that feature for free. The Chicago-based aircraft manufacturer outlined and demonstrate the changes to the 737 Max to pilots, airlines, regulators and media on Wednesday. "As the aerospace system and its components become increasingly more complex, we know that our oversight approach needs to evolve to ensure that the FAA remains the global leader in achieving aviation safety," Elwell said in prepared remarks. In prepared remarks, Elwell had said that the 737 Max will return to service "only when the FAA’s analysis of the facts and technical data indicate that it is appropriate." Lawmakers have increased scrutiny on Boeing and the FAA following the two crashes. Late Tuesday, Rep. Peter DeFazio, D-Ore., chairman of the House Committee on Transportation and Infrastructure, urged the FAA to conduct a third-party review of the 737 Max. On Wednesday, the Department of Transportation’s watchdog said it started auditing the FAA’s certification of the plane, a process Transportation Secretary Elaine Chao requested last week.